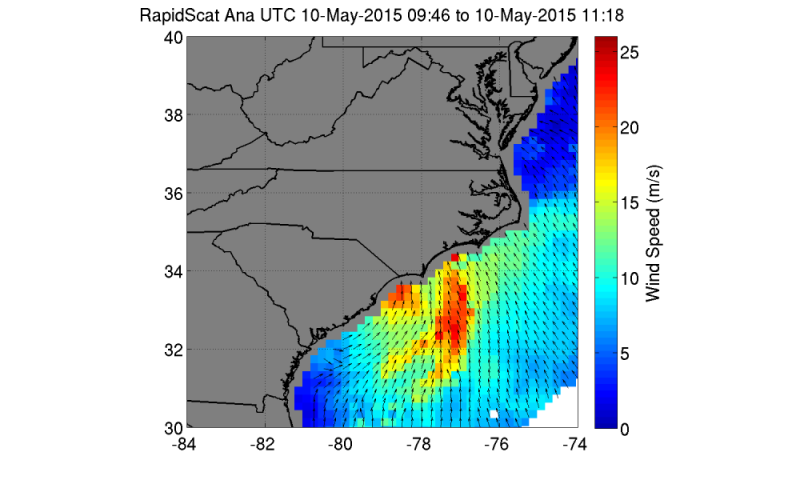 This was no Mother's Day gift to South Carolina as Ana made landfall on Sunday. Just before 6 am, Ana made landfall north of Myrtle Beach, SC with sustained winds of 45 mph, lower than the 50 mph winds it was packing as a tropical storm over the Atlantic. After making landfall, Ana transitioned to a tropical depression and is currently moving northward through North Carolina and will continue its trek northward. Heavy rain and storm surges are expected in the storm's wake. Storms of this size will create dangerous rip currents so beachgoers should be wary of Ana as she makes her way up the coast. As of the final warning posted for Ana on May 11 from the National Hurricane Center, Ana was 10 miles north northeast of Whiteville, NC moving north northeast at 7 knots. Its winds are 30 knots gusting to 40 knots. As Ana moves inland it will further weaken and become post-tropical. The remnants will head out over the Atlantic. Until then, rainfall totals of 2-6 inches can be expected over the Carolinas in her wake. Storm surges of 1 to 2 feet above ground at high tide may be seen from Cape Hatteras, NC into and throughout South Carolina.